Did you get hit with alternative minimum tax (AMT) in prior years? And did you wish that Congress at least reduce its impact or get rid of AMT entirely? If you answered “yes” to both questions, then I got great news for you. Hello, this is Noel Dalmacio, your ultimate CPA at LowerMyTaxNow. AMT is a different way to calculate income tax. It was enacted in 1969 to make sure that high-income taxpayers paid their fair share of taxes, regardless of how many deductions they took. However, the exemptions were not increased for inflation purposes. So over time, as the wages went up, the AMT started to impact more middle class taxpayers. However, with the recently passed new tax law, you might be able to take advantage of the new and friendlier 2018 AMT by reducing its impact. That means a lot of taxpayers making between $80,000 up to $1 million can now take advantage of the higher exemption phase-out thresholds. The AMT usually happens when a taxpayer have a lot of deductions and credits that are not allowed for AMT purposes. But with the passing of the new tax law, some of the disallowed deductions were either limited or completely eliminated. The state and local tax deduction were limited to $10,000 while the personal exemptions and miscellaneous deductions subject to the 2% floor were eliminated. With the increase in AMT exemptions and dramatic increase in the exemption phase-out ranges, far fewer taxpayers will be paying AMT. According to estimates, 98% of the taxpayers subject to AMT have either the state & local taxes & miscellaneous itemized deductions subject to the 2% income threshold. With the significant changes on these two items and the increase in AMT exemptions and phase-out thresholds, many taxpayers will no longer be subject to AMT. 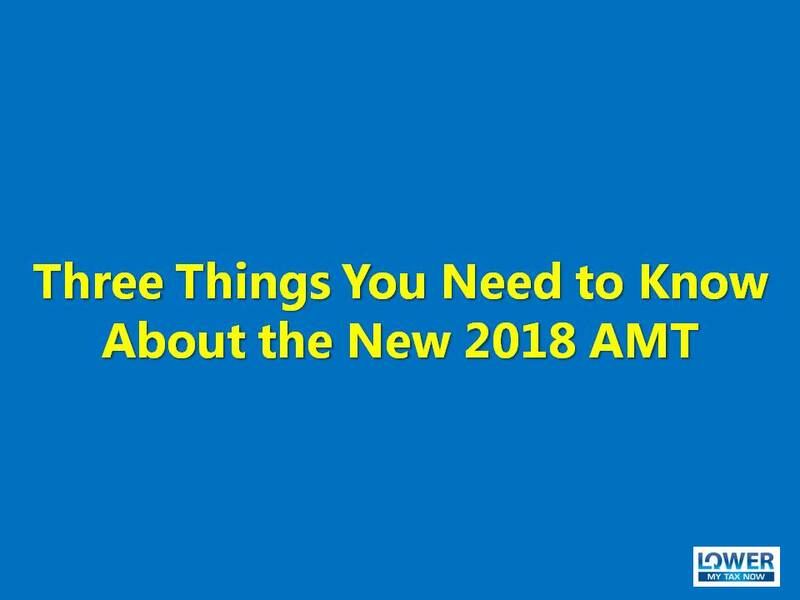 To recap, those are the three things you need to know about the new 2018 AMT. If you like to learn more, click the link lowermytaxnow.com and sign-in to receive my weekly blog. Until then, this is Noel Dalmacio, your ultimate CPA at lowermytaxnow.com.